Can you believe the hype you hear from Sony, Microsoft and Nintendo at each year's big E3 circus of video games? Year after year, the big three make promises about their consoles and their games. Do they deliver? Each year, we check. Microsoft, last year we had to scold you for some of your unbelievable Project Natal hype. But enough about the promises you made in 2009. Your 2010 E3 promises go under our nitpicky microscope today. 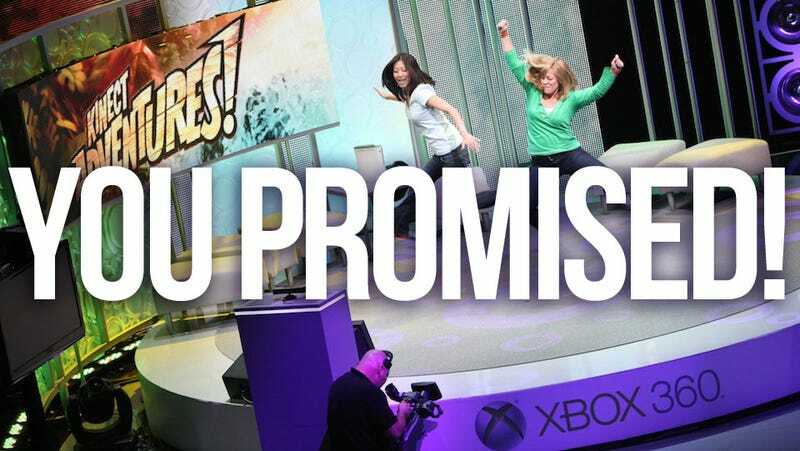 One Year Later, Did These E3 Xbox 360 Promises Come True? On June 14th, 2010, Microsoft gave its E3 media presentation, where it unveiled its top prospects for the coming year. As always, they showed off new games, hardware and features in order to get gamers excited and commit to the Xbox 360 as their premiere console. The bulk of Microsoft's presentation and their goals for the year revolved around the launch of the Kinect. Microsoft claimed that their controller-less wonder would hit retail stores worldwide during the 2010 holiday season, specifically highlighting the U.S. on-sale date, November 4th, 2010. As for the games, Microsoft boasted that 15 games would launch alongside the Kinect. They specifically highlighted six exclusive launch titles: Kinectimals, Kinect Sports, Kinect Adventures, Kinect Joy Ride, Your Shape: Fitness Evolved and Dance Central. Of those six, there are only two third-party games, Your Shape and Dance Central. Verdict: They were mostly correct. The Kinect was released in the U.S. on November 4. While there were only 13 games available on day one, four more games were released that month. Let's not be too picky, okay? Both EA Sports Active 2 and Zumba Fitness: Join The Party were highlighted as launch titles during Microsoft's presentation, but weren't actually day-one titles, releasing on November 16th and 18th, respectively. Depending on how you judge it, they came out either slightly behind or slightly ahead. As for Microsoft's featured, "exclusive" Kinect games, all six were ready for day one, and neither Your Shape or Dance Central were released on the Move or Wii. The big surprise of Microsoft's E3 2010 keynote was the unveiling of the Xbox 360 slim, a sleek new version of the console with a "whisper quiet" 250 GB hard drive and a built-in wireless reciever. The amazing part of the announcement wasn't the hardware itself, but the release date. Spencer claimed that the Xbox 360 Slim was shipping to retailers that day and would be available in stores that week. Verdict:They made good. The 360 slim was in stores that week. The Xbox 360 vision at E3 2010 wasn't just about video games. Microsoft brought out SportsCenter hosts Josh Elliott and Trey Wingo to show off a new ESPN app, which would allow Xbox Live Gold members to stream any live sporting event available on ESPN's online service, ESPN3 for free. The games available to watch included college basketball, college football, Major League Baseball games and NBA games. Verdict: Not quite. The ESPN app is out now on Xbox Live, and is available to all Xbox Live Gold members. That said, similar Netflix or Hulu Plus, in order to use ESPN3 you have to get your internet connection through a cable provider that broadcasts ESPN. In other words, the ESPN app was instantly available for a lot of people because they already had the services required for access, but there are people out there who may not have the right internet provider, so it's not really available to everyone. After showing a Black Ops demo, Microsoft had a big announcement: Downloadable add-on content for the Call of Duty franchise would be released exclusively for the Xbox 360 for a limited time, before eventually making its way to other platforms from 2010 through 2012. For our purposes, that means that any and all Black Ops DLC would be initially released as an Xbox-exclusive. Verdict: They kept their word. Both of the CoD map-packs, First Strike and Escalation were released on Xbox Live before making their way to the PlayStation Network and Steam. First Strike was available on XBLA on February 1, released for PSN on March 3, and the finally hit Steam March 25. Escalation was released on May 3 on the 360, and won't be coming to PCs until June 2. There is still no release date for the PSN version. Microsoft talked about how Windows Phone 7 would allow smartphone-toting gamers to bring their XBL profile, including their Avatar and Achievements, wherever they go. Verdict: True. The first Windows Phone 7 devices launched last December. With a WP7 phone, XBL users can check see their Avatar and look at their Gamerscore. According to Xbox VP of marketing Marc Whitten, Microsoft planned to bring Xbox Live and Kinect to every country where the Xbox was being sold. Verdict: It's iffy. According to the Xbox Live website, the service is available today in 35 countries. The Xbox 360 was initially released in 36 countries, so they don't seem to have gotten there. That said, Xbox Live became available in nine new countries, including Greece and Brazil, last December, which was progress toward their goal. Microsoft announced that they were working with Crysis 2 developer Crytek on developing an Xbox-exclusive game called Codename: Kingdoms. Judging by a very short trailer, the game appeared to be set in ancient Rome. Verdict: It's unclear: Crytek hasn't released any new information on Kingdoms since last year, though they did say that the game was still in development when the company laid off employees this month. Towards the end of the show, Forza developer Turn 10 showed that the next Forza game, Forza 4 would be released in 2011 and would feature Kinect controls. Verdict: They're right on track. Forza 4 is currently slated to hit stores this fall. (It looks good, too!) As for Kinect compatibility, there's been no word since last year, but given that they showed it working last year I'd bet that it's still in there. Gears of War series creator Cliff Bleszinski and three friends played a section of Gears of War 3 in four-player co-op, a feature that had been publicized in the months leading up to E3. The previous Gears games only allowed two gamers to play the campaign together. Verdict: There hasn't been any news that four-player co-op has been taken out of the game, but there hasn't been any new footage of it either. Still, I'm willing to give Epic the benefit of the doubt. Bungie gave the world a first glimpse at the campaign of Halo: Reach at last year's show, and mentioned that the game would be out that September. Verdict: 100% true. Reach was released on September 14th, 2010. Game designer Peter Molyneux introduced footage of Fable III, saying specifically that the game would be released as an Xbox exclusive on October 26th, 2010. Verdict: The release date was right on the money. Fable III was on store shelves on 10/26/10. The exclusivity part, on the other hand, is a little more tricky. Despite being billed as a Xbox 360 exclusive, Lionhead announced that a PC version would also be available shortly after the game's initial release. At first, the PC version was supposed be released at the end of 2010, and would remain a "Microsoft exclusive", as it would only be digitally available via Micosoft's "Games for Windows - LIVE" service. The PC version was delayed, which led many to question whether the PC version was coming at all. In April, Lionhead said that the PC version was on the way, and would be available via both "Games for Windows" and Steam. After all that, the PC version of the game came was released on May 17. So it's not like Fable III ever became a Mac or Wii game, but that Games For Windows exclusivity didn't amount to anything. And What About That Star Wars: Kinect Game? To close their Kinect presentation, Microsoft announced that Lucasarts was working on a Star Wars game for the Kinect. According to the very short gameplay clip shown, players control a jedi, deflecting lasers with a lightsaber and using the force to throw enemies and objects, before Darth Vader arrives to challenge you. The trailer revealed that the game would be released some time in 2011. Verdict: Similar to Codename: Kingdoms, nothing has been said about this game since last year's E3 (we did get this tiny leak, though). There are seven months left in 2011, so it's a possibility. But why so quiet about this one, Microsoft? Final Verdict: Much improved! For the most part, Microsoft made good on their claims from last year. The Kinect launched on time, the release dates were often right, and all of the games shown still exist as far as we know. They did make some false claims, but looking back it seems that Microsoft's strategy in 2010 was to be non-committal on most items that weren't related to the Kinect.